Toon Tuesday 3/5/13 The ABSOLUTE FINAL FINAL 430! Okay kids, you’ve seen this twice already, but darned if every time I posted this, I’d find another notable crew member. 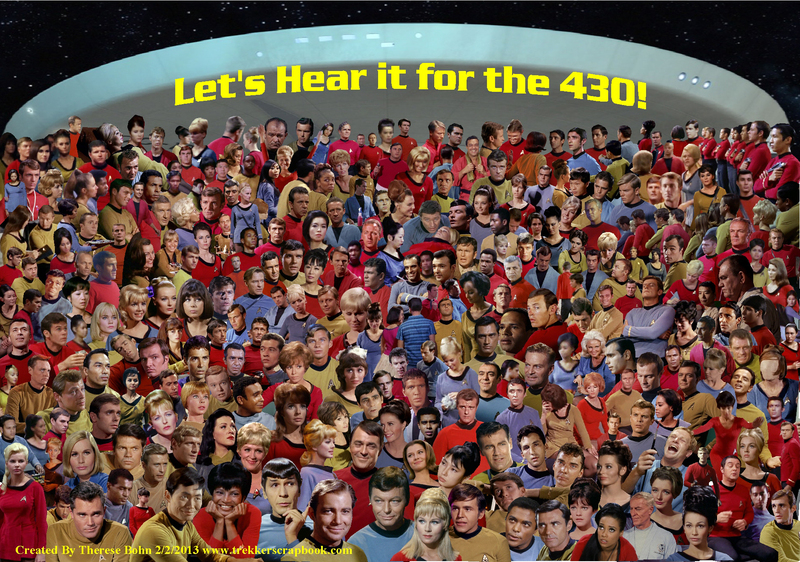 So at this time, I am very pleased to announce that this is the final Final FINAL version of my design “Lets Hear it for the 430”! I added more room to the top and added the saucer head of the Enterprise to hold all these people in. Really, this is it. Done, Finished, Kaput! Making this drove me a little crazy, but it was worth it. Why should the top two always get all the credit? 😉 Be sure to click on image to get the full details. (A Key will be up soon so you can identify most of them) Thank you and good night. This entry was posted in StarTreKomics!, Toon Tuesday and tagged Final, Star Trek crew. Bookmark the permalink.